Sultan’s Gold from Playtech is shamelessly themed on Walt Disney’s Aladdin, with conspicuously no mention of the hero, or his magic blue sidekick anywhere. It’s an average looking machine with uninspired artwork and a lack of interesting bonus features. The top jackpot is hardly spectacular and the return-to-player rating isn’t amongst the highest out there either. All told, there’s not a lot to hate or love on this machine. It’s just lacks excitement, even for fans of the franchise it’s been blatantly plagiarised off. In terms of specifics, the game is played across three rows and five reels. There is a total of 20 win lines that can be active at once and this number is variable. The game’s main (only) feature is its free spin round with mystery wilds added to the reels. Interesting take on free spin round. The addition of “mystery scatters” during bonus games adds some additional enjoyment and chances to win. It’s not exactly riveting but does enhance gameplay somewhat. Just one bonus feature. There feels no reason (other than possible copyright infringement) to not include a genie and a three wishes reference as a bonus round. “Pick a lamp to reveal a wish/cash prize” took us literally seconds to come up with, we’re sure a designer like Playtech could manage far better. As stated, there’s not really a great deal to love or hate on Sultan’s Gold. It’s just very middle-of-the-road, particularly when reviewed in 2017. Sultan = 5,000x the line bet. Princess = 2,000x the line bet. Lamp or sabre = 750x the line bet. Sultan’s Gold isn’t the most feature-rich machine out there. With just one bonus round, players might find the gameplay becomes stale quickly. If players are fortunate enough to land three or more of the palace “scatter” symbols anywhere on the reels, they’ll win ten free games with a mystery scatter. Before the round begins, one of the symbols is chosen at random. 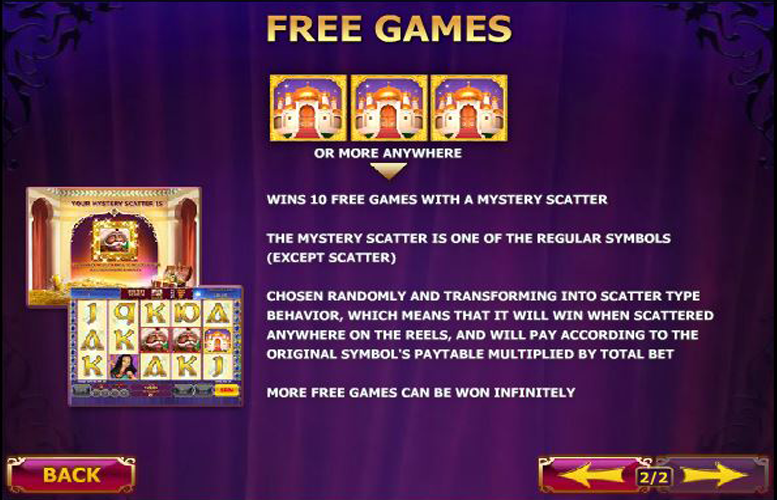 During the free spins, mystery scatter symbols replace all the chosen symbols across the reels and they behave in the same way as scatters (pay for any position across the reels rather than on strict win lines). Payment is made in accordance with the original symbol’s entry on the pay table. During the free spin round, three or more palace scatters will trigger additional free games. This dynamic can occur infinitely. Queen, Jack or 10 = 100x the line bet. 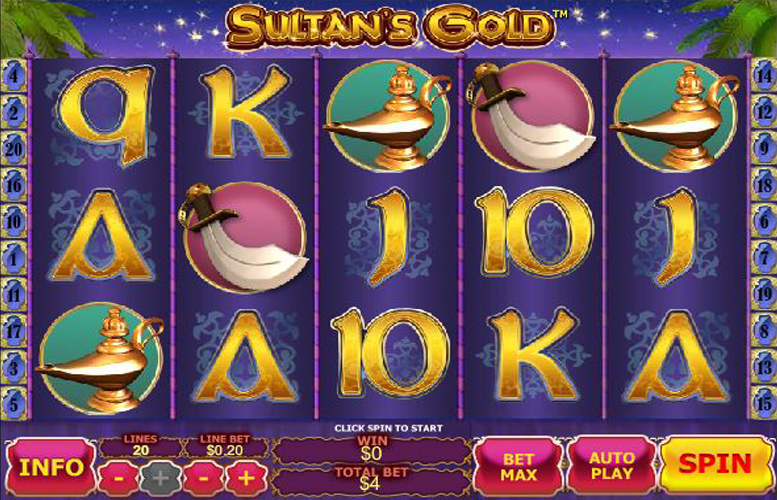 Players are given plenty of opportunity to experiment with different betting sizes on Sultan’s Gold. They can adjust both the number of pay lines played per spin and the size of the bet per line. The minimum line bet is just 1p, and the maximum is a sizeable £50. This makes the lowest bet per spin possible just 1p, and the highest, using the largest bet per line and all 20 possible win lines, an impressive £1,000. 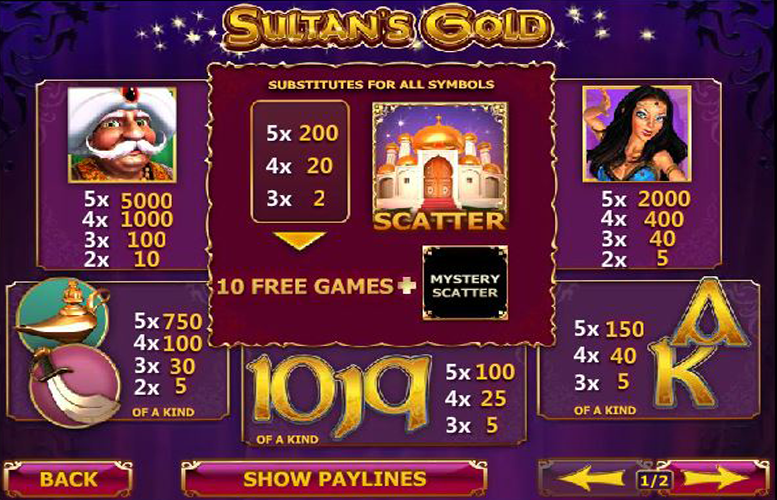 All told, Sultan’s Gold by Playtech isn’t a bad offering. It has a free spin bonus, the artwork isn’t amazing but isn’t repugnant either, and the top prize is reasonable, if not staggering. Everything about this game is uninspiring and to be honest it feels like a filler title, thrown together fast. Simplistic CGI symbol design and the lack of bonus features add to this rushed feel to result in a slot that’s just a bit “meh”. This game has a rating of 3 / 5 with 473 total reviews by the users.